Consider what you hope to accomplish by declaring bankruptcy on a manufactured home mortgage. It is a secured debt, like a car loan or a mortgage on a house. Federal bankruptcy law gives you three options for dealing with secured debt: reaffirm the mortgage; refinance the mortgage; or in the case of a Chapter 7, relinquish the property and discharge the debt. Filing Chapter 13 allows you to stop a foreclosure or repossession and make modified debt payments, based on your ability to pay, through a trustee. Filing Chapter 7 allows you to discharge debt immediately, but you must pass the means test in order to qualify. If your assets and income are higher than the norm in your area, the court may require you to file Chapter 13 instead. Once your other debts are gone, do you realistically have the money to continue making the payments? Is the manufactured home worth as much as you owe on it? Is your interest rate in sync with today's market? Are your mortgage payments current? If you answered yes to all four questions, reaffirmation may be a good choice. 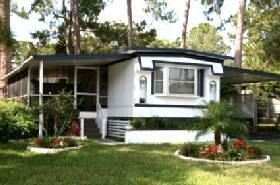 Consider refinancing your mortgage and keeping your manufactured home if you have adequate resources. You may have more bargaining power with your lender than you know. Creditors want to make profits. Since there are costs associated with taking your property and reselling it, many lenders are willing to negotiate. This is especially true in the case of manufactured homes, as their value may depreciate over time. Sit down with your banker, let her know you are considering filing bankruptcy, and propose terms that you believe are reasonable. She may accept, come back with a modification or walk away. If your lender is uncooperative or if you have lost your job and simply can no longer afford the home, discharging your debt may be the only option left. In this scenario, the lender takes your home and you walk away from the debt. You must file Chapter 7 for this to happen. Chapter 7 is not mutually exclusive of repossession or foreclosure. When you discharge a secured debt through bankruptcy, you have agreed to relinquish the property, but the lender still has to take possession. How and when they do this is governed by a variety of state laws. If you have a deed to your manufactured home the lender must follow treat the property as real estate and follow state foreclosure laws. If you have a title, rather than a deed, state laws become more complex. A lender may still be required to treat your home as real estate, or she may be permitted to treat it as personal property and simply repossess it. A judge may have to decide whether the lender may foreclose or repossess your property, and his decision may depend upon how the manufactured home is attached to the ground. Either scenario has its pros and cons. Foreclosures take longer than repossessions. You may remain in your home for a longer period of time, but you will also be responsible for utilities, insurance and upkeep of the property during that time. Rebuilding your credit may take longer when you have a foreclosure instead of a repossession. When you try to obtain new credit, lenders look at how long ago your credit problems occurred. If your credit history shows a bankruptcy or a repossession you may begin rebuilding your credit immediately after the event. If you have a foreclosure on your record the event may remain open for a year or more, until the lender takes possession of the property. Whether your goal is to start fresh in a new location or wipe the slate clean where you are, sometimes declaring bankruptcy on a manufactured home mortgage is the best way to move forward with your life.